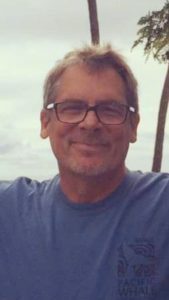 On February 10, 2019, at the age of 62, Billy Damian Poufcas, loving husband, father, and grandfather passed away after a short but valiant battle with cancer. Billy was preceded in death by his parents, Panagiot “Pete” and Barbara (Evans) Poufcas; his brother, Doug Poufcas; and his best friend, Fi Fi Poufcas. He is survived by his wife, Karen (Perry) Poufcas; daughters, Jennifer (Matt) Warncke and Billie Jo Poufcas; granddaughters, Alexis Doyle, Lena Doyle, and granddog Jackson; brothers, Nick and Tom (Lori) Poufcas; sisters, Suzie Thiesing and Diane (Dan) Helms; as well as many beloved nieces and nephews. Billy was born in Lansing, MI, on December 2, 1956. He attended Holt High School where he was a proud Ram wrestler. He married his high school sweetheart, Karen, September 6, 1975. He did a stint in the military after high school, before being hired in at Fisher Body (General Motors) on September 3, 1976. He retired from GM in July of 2006. Retirement brought time to enjoy what he loved: traveling, domestic and abroad; working with his wife on UAW matters; and spending as much time as he could with “his girls” and the rest of his family and friends. After Karen retired, the pair found their happy place and settled in Naples, FL. There they enjoyed hosting guests, hanging with friends, dinners, pool time, and sunsets on the beach. The funeral service will be held at 10:00 a.m. on Monday, February 18, 2019, at St. Andrew Orthodox Church, 1216 Greencrest Ave., East Lansing. Interment will follow in Evergreen Cemetery. His family will receive friends from 2-4 and 6-8 p.m. on Sunday with a Panikheda service held at 7:30 p.m. at the Estes-Leadley Greater Lansing Chapel. In lieu of flowers, please make donations to the Old Newsboys or a local cancer charity of choice in memory of Billy. I am so so sorry, my thoughts and condolences to you and the family. Beautiful and treasured memories will always be remembered. Blessings to the whole family. To this wonderful family, that lost a great guy way to soon. Prayers and lots of hugs . Words could never be enough. God please give them the strength. So sad at your loss Karen and family. May the Angels lead you into Paradise. Another hole in our Hearts. Billy was a GREAT guy & I enjoyed working with him & being his boss. Praying for you and your family. R.I.P. Billy. I’m so very sorry for the loss of your sweet Billy. Your true soul mate. May you find comfort and peace. Sending you and your family many prayers and much love. Karen, I’m so very sorry for your loss. Hugs to and may you find peace n the days to come. Karen & family, sending you thoughts and prayers during this difficult time. Hugs to you all! Karen and family. So sorry for your lost. Billy will be remembered with fun and humorous times. Love to you all and God Bless. Karen and families our hearts and memories for all of you going through this loss of Billy ..the son, brother, husband, father, grandfather and friend of many. Hugs. I am so sorry about the passing of Billy, my heart and love goes out to the Families. It is such a shock, so sorry for your loss. Hugs and prayers be with you. Billy was a good man. We are so sorry to hear of your loss. Billy was a beautiful soul. He will be missed dearly. Sending hugs your way. Please reach out to us if we can do anything to help you during this difficult time. We love you all. May God bless and comfort your family. Admire the love you two shared, and may Billy rest in peace. My Prayers are out to your Family Karen I’m so sorry for your Loss, Billy will be dearly missed. RIP Billy. Prayers for your family Karen we well miss Billy this year at Houghton lake, Hope to see you soon. Karen, you and Billy had something very special ! You will always have fond memories of all the things you shared together. We will miss him so so very much. Much love and Hugs ! I’m so saddened to read of Billy”s passing. I have many fond memories of him throughout our school days in Holt. May your heart find peace and comfort. My sincere condolences to you in your loss. Even tho’ it’s been a really long time, I’ve never forgot you two. I’m so sorry for your lose. Billy we will never forget you, and bro you will always bring a smile. My condolences to the family. My heart is broken after hearing of Billy’s death. Feel so bad for you and the girls, l am in Florida so I will not be at the funeral but my prayers are with you.